One of the top manufacturers in the dehumidifier industry is Danby. They create numerous home comfort appliances that are exclusively built to fit in with your current lifestyle. With numerous color options, capacity choices, and many of them Energy Star compliant, you might just discover that your best purchase this year is a Danby dehumidifier. What Danby dehumidifier is right for you? With a variety of models available to select, it is important to compare and contrast the features, which this manufacturer have made available. The chart below will help you do just that. Why Choose Danby For Your Next Dehumidifier? Danby has one vision: to create a “brilliant and inspired” dehumidifier that is designed to fit your home. Their designs are classic, yet still innovative, so you receive a unit that will effectively decrease the humidity levels in your home. Danby is a family-owned business with 65+ years of experience creating innovative products for your home. As one of the leading specialty appliance manufacturers in North America, you can rest assured that the craftsmanship of your dehumidifier is guaranteed. In the unlikely event you have a problem with your purchase, you can contact Danby’s customer service team by phone or email at your convenience. Danby also raises the bar on dehumidifier warranty options. All of their products come with a 12-24 month warranty that includes parts, labor, and in-home service when necessary. Most of Danby’s dehumidifiers are designed to be multi-room or whole home solutions You’ll find capacities ranging from 30 pints to 70 pints with their designs today. You’ll also find two-speed options available, low noise options, and built-in pumps with some of their models. This is why the best Danby dehumidifier reviews must be part of the shopping equation. It’s the best way to find a dehumidifier with the features your home needs. You’ll also want to look at the auto-defrost features that may be available on your Danby dehumidifier so you can improve your units performance. Turning this feature on will help it to automatically switch the dehumidifier into defrost mode until it has been removed. Danby also utilizes R410A refrigerant in their dehumidifiers, with direct drain options available. Size matters, but so does optimizing your dehumidifier. Danby offers these 5 tips to make your dehumidifier even more energy efficient. What Are the Prices of Danby Dehumidifiers? Danby dehumidifiers are one of the most reasonably priced brands. You’ll find 30 pint models begin around the $150 price point, with high capacity models often coming in below $250. Only a couple of models are priced about $300, and a premium price point for a Danby dehumidifier would be above $500. This 60 pint model works very well in homes that are moderately damp. It is effective in those conditions for up to 1,000 square feet, but drier homes of up to 3,000 square feet may also see stabilization benefits. The washable air filter is easy to maintain and two drain hoses are included so you can use the continuous draining feature if you wish. Programmable humidity settings combine with two fan speed settings so you can have perfect results every day. This premier dehumidifier might just be one of the best this manufacturer has ever produced. Designed for areas of up to 1,500 square feet, you’ll receive 30 pints of capacity within 24 hours of use. Two fan speeds are available on this Energy Star compliant model. The auto restart feature lets you deal with power outages efficiently, while the single push button controls give you effective customization. If you want affordable control of your indoor humidity levels, this is the Danby model to consider today. If you don’t want a dehumidifier with continuous operation, then it doesn’t make sense to purchase a model with that feature. Instead, consider this particular 60 pint model from Danby to meet your needs. It still uses the R134A refrigerant that is environmentally friendly and it still has the electronic controls you want. You just have to empty the condensate bucket every so often, but in return, the durable casters let you take this unit from room to room. We loved seeing this dehumidifier and think it’ll do a great job for your home. This Danby dehumidifier is great for spaces that are up to 2,500 square feet in size. It works better in open spaces in our experience, but could provide some homes with a whole house benefit. It’s Energy Star compliant so you won’t have to worry about the power bill, but offers two fan speeds so you have at least a little customization. The auto restart feature is also nice, especially if you need to run this unit on a regular basis. It’s a nice little dehumidifier, especially considering the price. 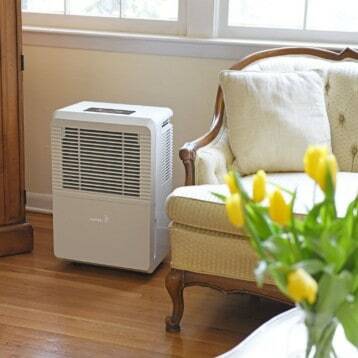 This is the dehumidifier you’ll want if your home is in a high humidity environment. It works extremely well in small very wet spaces or large moderately damp spaces. Included with the design is smart dehumidifying technologies that automatically adjust to your indoor environment so you always receive the maximum level of humidity control. Invest into this dehumidifier and you won’t be disappointed. These Danby dehumidifier reviews will help you pick out the best model for your home from one of the world’s leading manufacturers. If you want a dehumidifier that is as reliable as it is durable, then these are the dehumidifiers for you.